This is the “touch-up tube” from Japonesque – a really handy little set of makeup brushes that fit snugly into a lightweight metal tube. I have been using these quite regularly due to the fact that I have packed away nearly every single makeup brush that I own into a big box (trying to be organised) and then lost the big box (top marks, Crilly). I have a feeling that the big box is now in the garage somewhere, but Mr AMR has been having one of his “sorting out” sessions, so God only knows where my brushes will have ended up! Anyway, these little Japonesque brushes are doing quite nicely. If I’m absolutely honest, I’d do away with the “powder” brush, which in my opinion is too small to do anything remotely useful with, but the rest are good. I have loads of proper Japonesque brushes and they are excellent (the reason that I packed all the brushes up was because I was about to film a video of them!) and the versions in the touch-up tube seem to have the same bristle quality but with lighter, more streamlined handles. Apart from the powder brush, which I have removed from the tube and demoted to the “spares” pile, the touch-up tube contains a foundation brush, a lip brush and two eye brushes. Apparently. I have a feeling that the brush to the far right is supposed to be the foundation brush, but again, I think it’s much too small, so I’ll just tell you what I’ve been using each brush for! 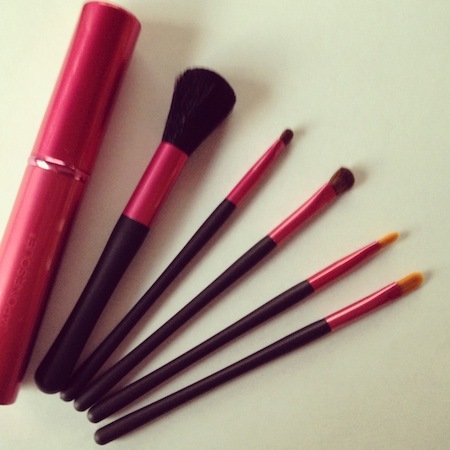 From left to right, we have the powder brush (gone), and then two eye brushes which are both very good. I use the larger eye brush for sweeping colour over the lid and the smaller for pressing darker powder colour into the lashline or into the crease. The next brush (yellow bristles) is my cream eyeliner brush and I use it to apply and blend my YSL Faux Cils Eyeliner. It’s supposed to be a lip brush, so you could use it for that, but I rarely use a lip brush and it’s the perfect shape and size for doing a messy, sultry smoky eye. The last brush (far right) is used for concealer application and blending. It’s great for working a cream concealer neatly into the creases at the side of the nose and for covering blemishes. The Beautiful Eyes Touch-Up Set is £16.50 from JohnLewis.com but I’ve also just spotted a different version: a four brush set with angled eyebrow brush and eyeliner brush. I’d be tempted to go for that one if you, like me, feel the powder brush is a little superfluous to your needs! It’s really, really well-priced too: £11.50 from JohnLewis.com again. I’ll be doing a video on my favourite brushes soon, so stay tuned for that, but if you’re looking for a handbag-friendly short-handled set then I think that the Touch-Up versions from Japonesque are great value!